Redesigned. Common problems with wind noise around the front side windows and the fuel door release. Redesigned for this model year. Dramatic improvement in reliability compared to the previous generation. Common problems with CV joint boots, and possibly also wheel bearings. Common problems with wheel bearings and CV joint boots. Muliple reports of problems with head gaskets, cv joint boots, sway bar links, and wheel bearings. Redesigned for this model year. Most common problems involve struts, wheel bearings, steering pump, CV joints. Head gaskets are a common expensive problem with older Subarus. You won't find Subaru Outback reliability information like this anywhere else. Actual repair frequencies, not just vague dots. 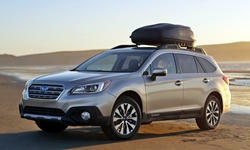 So you can tell how much the Subaru Outback truly differs from competing car models in reliability. These stats have been promptly updated four times a year, to much more closely track Subaru Outback reliability as the cars age. Others tell you how reliable the Subaru Outback was a year ago, when the cars were a year younger and had 12,000 fewer miles on them. Only TrueDelta tells you how reliable the Subaru Outback has been recently.